Another Fall/Winter and another ‘Wow’ on some people’ lips after exploring some Websites. You might be wondering, what is so great about these Blogs?, Our reaction to this is that these are Blogs representing the state-of-the-art Jewelry Fashion Trends and who are these people’, they are a huge group of obsessed human race we call Women and why they shouldn’t be, It’s their utopia, An oasis they find out after searching so hard for so much time. So what left the Voguish World spellbound, space-bound and speechless? IT would be shame for if we don’t consider the peak Brands – Chanel left us astounded with the so called ‘Offbeat Jewelry’. Chains and Bangles held by waist, neck, wrist and hair gave a so transiting dint. Stress on Individual Words in the fashion jewelry trends is rarely seen but when we saw it on the models appearing on the runway, it gave us butterflies. The long drop geometric floral earrings and the very un-geometric bracelets with coarse gold chains topped the trending list. Coming over to Dolce & Gabbana, the Look on runway was inspired more by minimalism in colors and more emphasis on Byzantines Cross jewels. No less than an incredulous moment for us to see the mineral necklaces that deserved elegant applause. Going out in them is the peak of following the Fashion Jewelry Trends. But the Everest of the same is when you see the Ear cuff Jewelry that disclosed the erudite face of chicks. The Good-Girl inspired look is so perilous; we feel the plight of Bad-Girls. Sculpted till inside the jewelry at Bottega Venetta is the winner of medallion. The so beautiful hue mishmash and the creativity in chain win the throne at any cost. The blue color is invited to the Ball of Fashion Jewelry trends by designer Oscar de la Renta who gave a delightful look to oversized and irregular precious stones and the earrings blended in gold. The wild and clannish side was discovered by us on our voyage that took us to Donna Karan’s show who was so stirred by the roots and earth that it appear solely inside every design of his. The catwalk that drove us to the punk zone was performed by the Versace Model with the dark ear nail accessorized with the Black Latex looking dress . Thanks to Roberto Cavalli who ended up giving us the bug brooches with wings to accouterment the models dress. 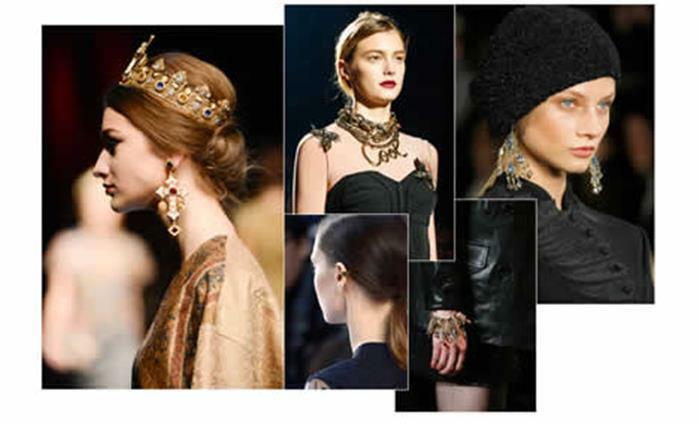 Ultimately, the Fashion Jewelry trends of 1014 rocked the stage at every show. Some came up with freshly baked ornaments and some reorganized the old ones. But the best thing was every trend had its own distinctiveness that added greatly to the attire and are worth following. It seems that there is one more reason for women to take control over the Trendsetting business.